Fish fingers are a particular favourite among children and a useful way of getting them to eat fish. Of course, there’s no reason why adults can’t enjoy eating them too, especially since they’re reasonably low in calories. Birds Eye Fish Fingers are a good source of protein as well as providing some of the essential fatty acid, omega 3. One Birds Eye fish finger has 62 calories, with the recommended portion size being three fish fingers, giving a total of 185 calories. 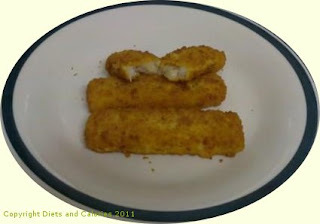 Cooking fish fingers is quick and easy. Take them straight out of the freezer and place them under a pre-heated grill for 12-15 minutes. Alternatively, cook them in the oven for the same amount of time, turning once or twice until they're golden and crispy. 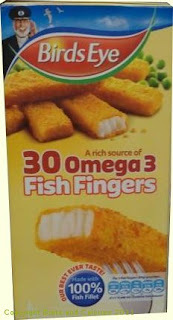 Birds Eye fish fingers are made with 100% fish fillet (Alaska Pollock fillet) which makes up 58% of the fish finger. They’re available in the freezer section of most supermarkets. Nutritional Information: Per fish finger (28g): 62 calories, 3.3g protein, 6.0g carbohydrates, 0.1g sugars, 2.6g fat, 0.3g saturates, 56mg Omega 3, 0.3g fibre, 0.2g salt.